Speech intelligibility is highly dependent upon the audience being able to differentiate speech from background noise. To enhance intelligibility, speech levels should be maximised and distributed evenly across the seating areas. This is achieved by a combination of methods. First, restricting space increases the amount of sound energy per seat. Secondly, consideration of the length of the hall, to respect distance losses and increase awareness of any visual gestures is advised. Finally increasing the number of early reflections to the audience will increase intelligibility. The lecture theatre at Bath University holds 350 people and has a volume of 1400 m3, this equates to 4 m3/seat, thus meeting the above criteria. Visual gestures made by the speaker can greatly improve the recognition of what is said. Although the benefit is not easily quantifiable, it is generally thought that the maximum distance from source to receiver should be no more than 20m. Firstly because this is the maximum distance a typical person can identify these visual prompts, and secondly, it ensures a good direct sound pressure level; essential for localisation. The Bath lecture theatre had been designed with a maximum distance of 15m, from source to receiver and, depending on the design of a building, this can limit the audience capacity. 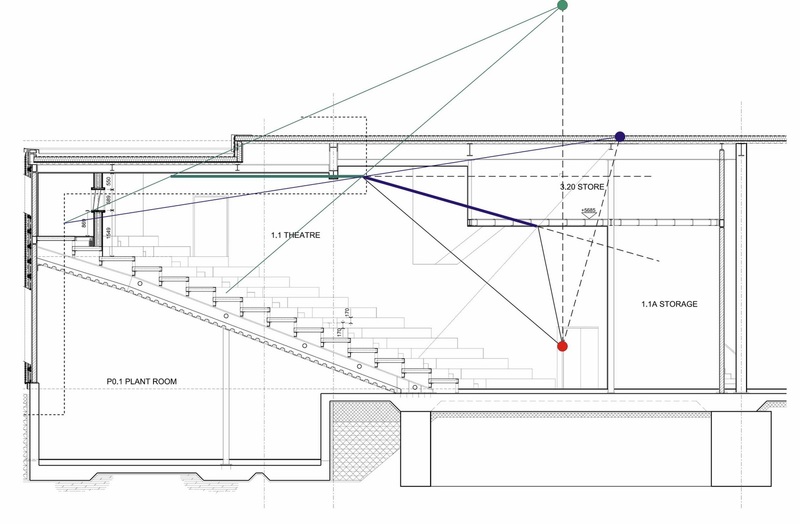 However, Bath adopted a fan shaped room to maximise the audience capacity yet maintain the source to receiver distance. As has been described, reflected sound plays a critical role in maximising loudness levels to the audience. Ideally, it is important to focus these reflections to the rear of the auditorium, since the direct sound at this point will be reduced due to the decay of sound over distance and the grazing effect of the audience. The method by which to focus these reflections is to correctly angle the surfaces at the front of the auditorium so that sound is directed towards the rear of the audience. adding angled side walls was not explored further. 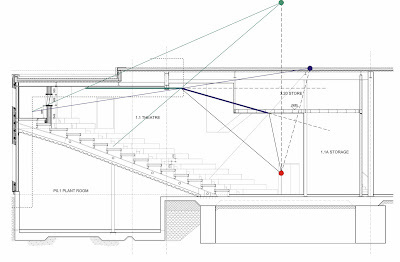 The angle and layout of the ceiling then became the critical factor affecting the acoustic performance of the theatre. The initial design of the ceiling was not favourable, the sudden step in the bulkhead and the down stand created by a structural steel, created two acoustic shadows on the audience. To overcome this, the ceiling height was dropped to make the ceiling flat across the structural steel (green line). An angled ceiling was then introduced (blue). The position was calculated using a geometric method such that the audience to the rear of the theatre would receive two separate early reflections, instead of one; greatly improving the speech intelligibility within the lecture theatre.